ENGINEERING. PRACTICE. POLICY. 61 February/March 2018 unmanned systems inside manufacturers begin to realize the benefits. There are a variety of other industries looking to this power source, which is also helping to pique interest, Yearling said. The automotive indus- try is starting to use hydrogen to fuel their cars. It's also being used as a backup fuel source for cell phone towers and emergency services like railroad crossing gates, to name a few examples. 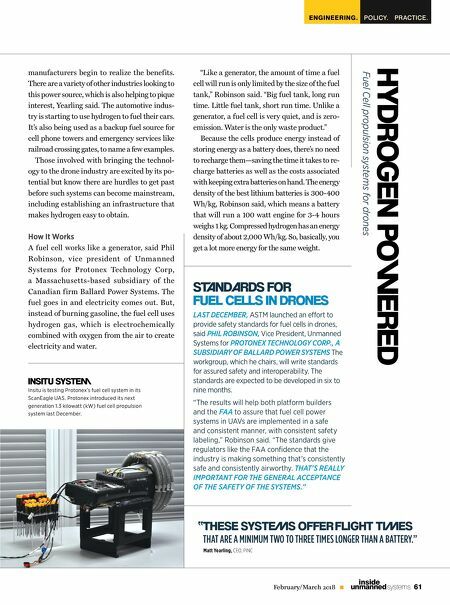 Those involved with bringing the technol- ogy to the drone industry are excited by its po- tential but know there are hurdles to get past before such systems can become mainstream, including establishing an infrastructure that makes hydrogen easy to obtain. How It Works A fuel cell works like a generator, said Phil Robinson, v ice president of Unmanned Systems for Protonex Technolog y Cor p, a Massachusetts-based subsidiar y of the Canadian firm Ballard Power Systems. The fuel goes in and electricity comes out. But, instead of burning gasoline, the fuel cell uses hydrogen gas, which is electrochemically combined with oxygen from the air to create electricity and water. HYDROGEN POWERED Fuel Cell propulsion systems for drones SNDARDS FOR FUEL CELLS IN DRONES LAST DECEMBER, ASTM launched an effort to provide safety standards for fuel cells in drones, said PHIL ROBINSON, Vice President, Unmanned Systems for PROTONEX TECHNOLOGY CORP., A SUBSIDIARY OF BALLARD POWER SYSTEMS The workgroup, which he chairs, will write standards for assured safety and interoperability. The standards are expected to be developed in six to nine months. "The results will help both platform builders and the FAA to assure that fuel cell power systems in UAVs are implemented in a safe and consistent manner, with consistent safety labeling," Robinson said. "The standards give regulators like the FAA confidence that the industry is making something that's consistently safe and consistently airworthy. THAT'S REALLY IMPORTANT FOR THE GENERAL ACCEPTANCE OF THE SAFETY OF THE SYSTEMS." INSITU SYSTEM Insitu is testing Protonex's fuel cell system in its ScanEagle UAS. 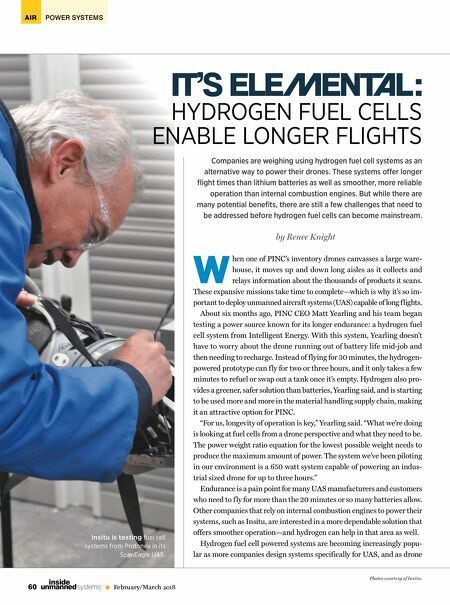 Protonex introduced its next generation 1.3 kilowatt (kW) fuel cell propulsion system last December. " THESE SYSTEMS OFFER FLIGHT TIMES THAT ARE A MINIMUM TWO TO THREE TIMES LONGER THAN A BATTERY." Matt Yearling, CEO, PINC "Like a generator, the amount of time a fuel cell will run is only limited by the size of the fuel tank," Robinson said. "Big fuel tank, long run time. Little fuel tank, short run time. Unlike a generator, a fuel cell is very quiet, and is zero- emission. Water is the only waste product." Because the cells produce energy instead of storing energy as a battery does, there's no need to recharge them—saving the time it takes to re- charge batteries as well as the costs associated with keeping extra batteries on hand. The energy density of the best lithium batteries is 300-400 Wh/kg, Robinson said, which means a battery that will run a 100 watt engine for 3-4 hours weighs 1 kg. Compressed hydrogen has an energy density of about 2,000 Wh/kg. So, basically, you get a lot more energy for the same weight.